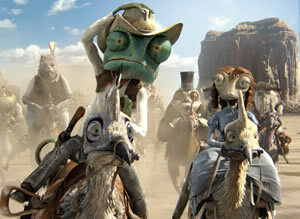 Rango is a terrific movie, but it isn’t for the kiddies. That’s not to say it’s dirty or otherwise inappropriate; it’s simply that the story will likely soar way over their heads. When Lee Unkrich gave his acceptance speech after Toy Story 3 was named Best Animated Feature Film of 2010 he thanked Steve Jobs and John Lasseter. He should've also thanked George Lucas. After all, a long time ago Lucas started up a computer animation wing at Lucasfilm and wound up selling it off to Jobs. So it's all the more interesting that Lucas is now fully into the computer animation scene and Rango represents his company's first full-length feature animation work. The quality of the animation certainly rivals Pixar’s best. The imagery is vivid and immaculately detailed, bringing to life a bizarre world of anthropomorphic rodents and reptiles. And, of course, the Spirit of the West. It ain’t easy being green – or red, yellow, brown, whatever color a scrawny chameleon-ish lizard needs to be in order to survive. And so it is a lizard with no name finds himself hurled out of a vehicle zooming down the highway, his airborne state brought about by an armadillo attempting to cross over to the other side – but becoming a road hazard in the process. Released from the glassy bonds of his aquarium, the lizard finds himself in a dusty town named Dirt and he quickly begins to regale the locals with fictional tales of his bravery. He certainly has a taste for the theatrical. When asked for his name, this creature – who boasts of being one of the few men who has a maiden name – has to give it some thought. That’s despite the fact he also allegedly has a pen name, an avatar, even – at least temporarily – had a pseudonym. And so it is he adopts a new name on the fly, so to speak, after seeing a bottle stamp that appeared to read “Hecho en Rango” (Made in Rango). Rango’s tall tales quickly escalate him to cult hero status and he’s enlisted as Dirt’s newest sheriff. The previous one lasted all of three days. With all the muscle and wit of Barney Fife, Rango is unwittingly entangled in the town’s water crisis. With the bank running low on water, its primary currency, Rango faces a crooked mayor and a rattlesnake with a high-caliber rattle. From the outset it’s clear Rango is playing to the beat of a different mariachi band. In fact, it’s a mariachi band of four owls that sets the stage, telling of a hero who has yet to enter his own story and ominously portending of said hero’s untimely demise. As for that armadillo, he miraculously escapes the fate of street pizza and talks of metaphors and enlightenment. Throw in allusions to surrealist paintings, an extremely quick cameo by Raoul Duke (that’s to say Hunter S. Thompson, whom Depp portrayed in Fear and Loathing in Las Vegas), and an extended cameo by the Man With No Name (that’s to say Clint Eastwood, as voiced by Timothy Olyphant) and there’s a moxie here that doesn’t fill the frames of typical animated fair. Savvy? Rango is the brainchild of John Logan (Gladiator, The Aviator), James Ward Byrkit (a collaborator from the Pirates of the Caribbean’s art department), and director Gore Verbinski (The Mexican). Together this trio of writers takes aim at some deep, dark metaphysical themes that won’t mean hooey to the children in the audience, but they’re also very smart about it. The kids should be able to appreciate the themes of people needing something to believe in, the importance of self-discovery, and the need to be one’s own human being (or chameleon). There’s also a cool chase sequence set to Ride of the Valkyries to satiate the thirst for animated action. Even so, it’s more fun to look under the hood and see what makes this engine tick. On the one hand, Rango makes some solid statements about the human condition. At one point in Rango it’s stated that no man can walk out on his story. And when Rango is asked the simple question “Who are you?” the answer is hardly simple for a lizard going through his own vision quest and self-discovery. There’s a lot of thematic terrain here that is similar to the ground Verbinski covered in Pirates of the Caribbean: At World’s End. In that flick, rock crabs carry the Black Pearl across the sand dunes of World’s End. In Rango, roly-polies perform a similar feat, carrying the chameleon’s carcass across the no-man’s land of the Desert Southwest. There are also musical riffs in Hans Zimmer’s score that hark back to that third Pirates flick and Bill Nighy imbues Rattlesnake Jake with some of the same speech affectations he gave Davey Jones. Those similarities don’t work against Rango. They actually do something to inform it. There’s a sense that Verbinski is exorcising some existential demons and mulling over a heavy menu of food for thought. The end result is a movie that works on the surface as pure entertainment, but offers enough philosophical undertones, verbal agility, and visual flourishes to make subsequent viewings seem like a good idea.